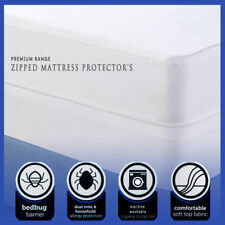 The list of features for this mattress cover is very impressive and include Protects both user and the mattress. Waterproof to all surfaces. Eliminates the risk of micro wrinkles and thus minimises the occurrence of bed sores. Mattress Cover Protector can aid in reducing symptoms of eczema, asthma, and severe allergies. Fitted Sheet Style Design - King Size Mattress Protector 78" x 80" - Fits up to 18" deep. To ensure a great fit, an elastic band is used on the side skirt to automatically pull excess material under the mattress. SafeRest mattress protectors trap dust mites, allergens and skin cells on the surface of the protector where they can be easily washed away during suggested quarterly launderings. 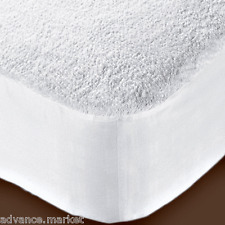 Our mattress protectors will not change the feel of your mattress. 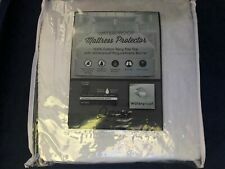 New Waterproof Matress Mattress Protector Fitted Bed Cover / Sheet - All Sizes!! ELASTICATED SIDES TO FIT MOST OF THE MATTRESSES!! 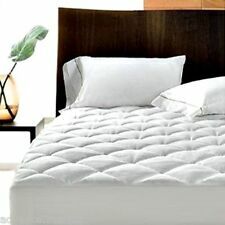 Extend the life of your mattress with the Healthy Nights Temperature Balancing Mattress Protector. 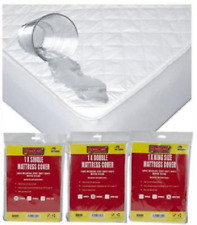 Healthy Nights Temperature Balancing Mattress Protector extends the life of your mattress. Waterproof and breathable to keep spills and stains from ruining your mattress and to help promote airflow. Luxury Quality Mattress Protector Topper Bed Cover Fitted Sheet Extra Deep 12"
PROTECT YOUR MATTRESS AND INCREASE THE LIFE OF THE MATTRESS. OR 75 cm x 175 cm BED WITH A 10" SKIRT FOR UPTO 9" MATTRESS. 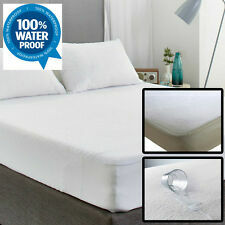 WATERPROOF QUILTED MATTRESS PROTECTOR. ELASTICATED SIDES TO FIT A MATTRESS LIKE A SHEET. All-way stretch and resistance free comfort. Resists dust mite. 76" x 80" x 12". 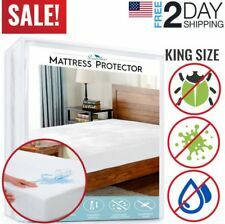 QUEEN Mattress Protector Terry Cotton Hypoallergenic Waterproof Fits up to 21"